cycle shop in the Breede Valley. Get a free test drive on a demo bicycle of your choice today! Demo bicycle models limited. Subject to availability. Silverback cycles offer better, faster, lighter bikes – that last. Expect spectacular design and expert engineering. The Sprint from Silverback is a Sports Dual Suspension Bike Platform with simple but effective kinematics to appeal to the global masses seeking a cool, new, trendy and affordable bike platform. Visit Cycle Scene and check out what this amazing lightweight performance bicycle has to offer today, don't delay. The Sido-2 provides a fast cross country and marathon bike that eats up distance efficiently. The Sido-2 provides seamless grip, control and comfort. Designed ideally for modern drivetrain configurations. The overall leverage ratio gives one a responsive feeling, coupled with small bump sensitivity and big hit control. The Sola range is designed for the performance orientated and weight conscious cross country rider. The all-new alloy frame is very lightweight, with carefully designed tubing profiles resulting in great stiffness and comfort in key areas. The larger 29 wheels smooth out the trails, inspiring confidence over rough terrain. The Siablo road bicycle fuses super lightweight aluminium tubing and compact geometry for an efficient, fast and comfortable road ride. Full carbon tapered fork adds to the lively and comfortable ride feel, thereby complementing the frame’s characteristics. Order yours at Cycle Scene today! The Spyke 24 is the perfect mountain bike for the up-and-coming junior cyclist. The alloy frame shares the same technology as its race-bred siblings, offering a great stiffness-to-weight ratio with junior specific geometry and a low standover height for easy fitting through the ages. Order yours at Cycle Scene today! The Senza 24 is the perfect mountain bike for the up-and-coming junior cyclist. The alloy frame shares the same technology as its race-bred siblings, offering a great stiffness-to-weight ratio with junior specific geometry and a low standover height for easy fitting through the ages. Order yours at Cycle Scene today! The Syncra is perfect for the performance rider that is looking for precision and stiffness. The 27.5 wheel standard achieves the perfect middle ground between 26” agility and 29” rolling efficiency. The Stride Adventure range has been tailored specifically for the needs of the recreational rider. The frames are made from lightweight alloy tubing and use sport-specific geometry to inspire confidence. Many wheel sizes are offered to suit your size and terrain needs, from mountain to road you can find your fit. The Sola mountain bike range is designed for the performance-oriented and weight-conscious cross country rider. The all-new alloy frame is very lightweight, with carefully designed tubing profiles resulting in great stiffness and comfort in key areas. All models come with compact tapered head tubes and short chainstays. At Cycle Scene Worcester, we go the extra mile for our clients. We promise that if we don't stock what you need, we will do what we can to find what you need. Cycle Scene cycling shop offers their customers value for their money, best prices in Worcester, honest and friendly service and high quality cycles. One of Worcester's most established bicycle shops, Cycle Scene has been supplying the Breede Valley’s cycling community with the world’s most trusted bicycle brands for over 22 years. Bicycle clothing is what makes or breaks the bicycling experience. It determines if you're comfortable while riding. Your bicycle clothing keeps you warm, dry, well padded and safe. Visit Cycle Scene for a wide range of clothing. We stock a wide selection of super comfortable, durable, quality helmets that inspires confidence. Features include a leather chin strap, excellent rear retention system and full wrap shell protects foam. Our cycling accessories for men and women looks good, wears good and stands the test of the road ahead. Another factor to consider is the awesome prices you’ll get our bicycle accessories for. At Cycle Scene Bicycle Shop we service and repair all makes of bicycles. Our bicycle workshop is fully equipped with a wide variety of bicycle parts for quick turn around service times. One of Worcester's most established bicycle shops, Cycle Scene has been supplying the Breede Valley’s cycling community with unmatched technical services for over 22 years. I'm passionate about the cycling industry. Providing fast and friendly service and products that are of high quality at affordable prices is my priority. I would like to thank you for your loyal support through the years. Cycle Scene are specialists in the cycling industry for more than 22 years. We offer friendly, speedy service and quality products at affordable prices. Cycle Scene strives to speedily and professionally tend to all customers needs. Cycle Scene are specialists in the cycling industry for more than 22 years. Before a cycle is sold, we try to arrange a free test drive on a demo bicycle. 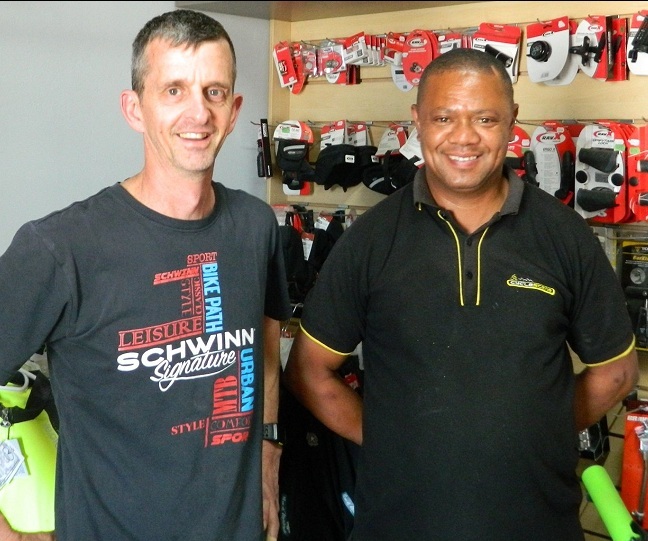 It's Cycle Scene's vision to become the most well known cycle shop in the Breede Valley. If cycling is your passion, please don't hesitate to pay Cycle Scene a visit. Cycle Scene is situated in Worcester in the Breede Valley and is a well known cycle shop that offers friendly, fast service and high quality cycling products and parts at affordable prices. Photo: Owner Philip Goosen (left) at the 8 Hour Challenge in Wellington with Ferdinand Rabie, Jaco Conradie, Raymond Stassen and Tapiwe. It's Cycle Scene's vision to become the most well known cycle shop in the Breede Valley. We invite you to pay us a visit. We offer quality products at affordable prices. © Copyright Cycle Scene 2016. All Rights Reserved. Website Designed & Maintained by REACH.